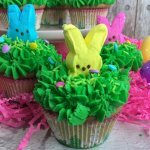 Easy recipe for cute and colorful Easter Bunny Cupcakes made with Peeps! Preheat oven to 325°F. Meanwhile, in large bowl, beat cake mix, butter, milk, vanilla and eggs on low speed for 30 seconds. Increase to medium speed for 2 additional minutes. Pour into baking cups in cupcake pan, filling each about 2/3 full. Bake 17-22 minutes. Allow to cool completely. Cream together the cream cheese and the butter in the bowl of a stand mixer. Add the powdered sugar one cup at a time. Add in the vanilla extract. Cut out a whole in the center of cupcake in which to place a Peep. You want the bottom 1/3 of the Peep to fit inside the cupcake so it will stay in place. Pipe your frosting over cupcakes around the Peep candy using a star pastry tip for a "grass" effect. Top with sprinkles and enjoy!